A report on alternative plantation forest species is now available on the New Zealand Farm Forestry Association website detailing the characteristics of a wide variety of tree species that are suited to steep erosion prone land and which have root structures that may better resist land sliding after harvest. The report was written by Dean Satchell, of Sustainable Forest Solutions, and contributes to present industry considerations of how to lessen the vulnerability of trees now being planted for harvesting decades in the future. Farm Forestry Association President, Neil Cullen says that land and forest managers are lacking in this sort of information for steep, erosion prone, terrain. 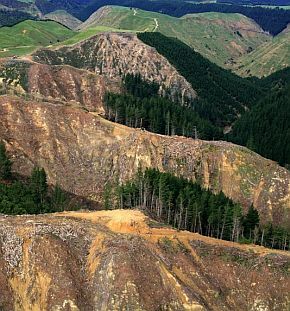 "This report identifies the considerable amount of research still required, but does go a long way to provide guidance on the options for land owners preparing resource consent applications to plant or replant land now zoned Red under the new National Environmental Standards for Plantation Forestry (NES-PF),” Neil Cullen says. Dean Satchell says that owners of red zoned land who wish to clear-fell need to provide regional councils with evidence that significant adverse environmental effects can be minimised. Those land owners should consider an erosion-mitigating forest cover on replant. “This report provides information on best practice, identifies the gaps in knowledge and sets the scope for the future to improve environmental outcomes from plantation forestry on steep lands,” he says. "We need more forests on steep hill country to mitigate erosion where pastoral cover isn't enough" says Neil Cullen. “This report lists a variety of alternative species available that could drive different harvest practices and improve environmental outcomes. It’s up to industry to be proactive and adjust their practices to reflect what society requires," Neil Cullen says. "This report suggests that alternative regimes and or species will be required now, which will accumulate evidence over time that significant adverse environmental effects can be minimised with best practice." Forest Owners Association President, Peter Weir, says the report is timely, since industry experts are engaging in finding effective ways through forest management and research priorities to build more resilient forests and more resilient communities.